John Maniscalco, who recently retired as the head of the New York Oil Heating Association after more than 20 years was honored with the Eye on Biodiesel Pioneer award at the 2016 National Biodiesel Conference. 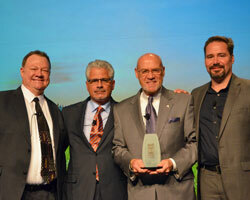 Maniscalco received the 2013 Industry Partnership award. Maniscalco was at the forefront of leadership in the heating oil industry, serving as the first treasurer of the National Oilheat Research Alliance before his time at NYOHA. He’s also been at the forefront of the industry’s move to Bioheat®, biodiesel in home heating. He was instrumental in New York City implementing legislation for B2 heating oil citywide. New York City continues to be a Bioheat® leader in the Northeast on both policy and public perception when it comes to cleaning up heating oil.